On Feb. 14, 1990 the Voyager 1 spacecraft looked back at our solar system and snapped a picture of Earth from a distance of about 6 billion kilometres. 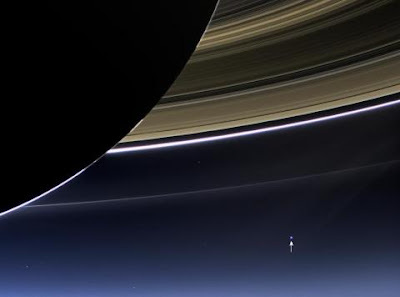 Our planet appears as a tiny dot against the vastness of space, among bands of sunlight scattered by the camera's optics. This image became known as "the pale blue dot." Each and every person ever to have lived is inside the frame of this photo. I also have a corner on that tiny dot, my Pale Blue Corner. Welcome to my Pale Blue Corner!